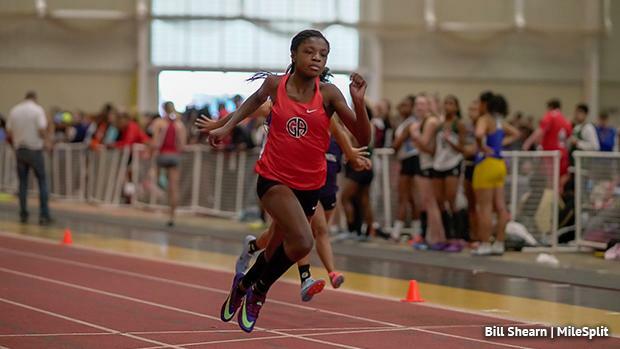 Moforehan Abinusawa wasted little time letting the state and nation get to know her talent in December at the Ursinus High School Invitational. Meet Pennsylvania's next big thing in the sprints. Abinusawa, who goes by Fore, opened up her high school career in dazzling fashion. In the finals of the 55 meters at Saturday's Ursinus Invitational, the freshman from Germantown Academy popped a 6.95 to roll to the victory. It's also the nation's fastest time so far on the young indoor season in the event. That time is the second fastest freshman 55 time in state history. It's also the fourth fastest time in state history overall. Saturday's career-opening performance by Abinusawa showed that she's ready to add her name to the rich history of Pennsylvania sprint talent. Abinusawa was slated to run the 200 meters later in the day, but decided to pass after feeling some tightness in her legs. There was also a big gap in between the two races during the all-day meet on Saturday. Still, the clock didn't lie in her sub-7 second performance. Abinusawa isn't new to the track and field scene. In the club ranks with Ambler Olympic Club, Abinusawa has already run times that would put her very high on some Pennsylvania all-time lists. Abinusawa ran outdoor bests of 11.59 in the 100 meters and 23.56 in the 200 meters. Both of those times would put her at fourth all-time in both events in state history. Thelma Davies, a Girard College senior and recent LSU signee, holds state records in the indoor 55 and 60 meters, as well as the outdoor 100 and 200 meters. Davies ran 6.85 as a ninth grader at New Balance Nationals Indoor back in 2016. She since broke the state record, running 6.77 last year at the VA Showcase. This could be shaping up to be a very interesting intra-state battle between Davies and Abinusawa -- the veteran and the freshman. Keep an eye out for two of the nation's top sprinters this winter.